Description: After the death of his brother, the last surviving heir to Talbot castle returns home to England from California. However, something becomes really wrong with the small country town when a gypsy family comes, just as the wolfsbane blooms. Bringing us many of the now accepted elements to the werewolf legend, Universal Pictures' 1941 monster classic sat at the very tail end of the golden era of Horror movies. Like it predecessors, The Wolf Man brings in human issues to the mix to better appeal to a general audience. In The Mummy, it was a love story that spun a thousand years, in Frankenstein it was giving flesh to ones deepest desires and here in The Wolf Man, the story is very much about the duality of mankind. The fight between reason and instinct, as it were. Our reluctant hero, played by Lon Chaney Jr., is a happy go lucky simple man of simple pleasures. Unlike his father who's into astronomy, he is not a scientist and prefers to work with his hands rather than jot down theories and trying to comprehend the universe. That's what makes Larry Talbot such an appealing character, aristocratic ancestry aside, Larry is very much an every man - compare that to the obsessed genius of Doctor Frankenstein or the cruel sexual predator of Count Dracula and the reason for the popularity of the character himself becomes clear. He did not bring himself into the problems he face, instead he is a victim of circumstance. That must've sat pretty well with the audience of 1941, in the beginning years of a world spanning war and the final years of the depression, the people of the movie's contemporary time stood before challenges they often times had little to no chance of fighting against. 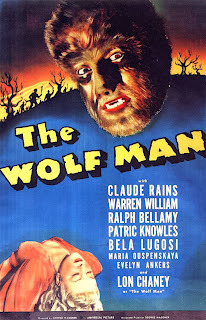 Lon Chaney Jr. would go on to portray both The Wolf Man (and later The Mummy) in several films afterwards, some of them in continuity with this one following the increasingly desperate attempts from Larry Talbot to get rid of the curse. This is a very atmospheric movie, set in Great Britain (it's undisclosed exactly where) the night scenes are abound with foggy wooden areas, where the ground is so damp that one's legs disappear into invisibility. Throughout the movie a poem is repeated meticulously, probably to make it catch on to audiences and make sure they understand exactly how the curse works. The photography of the movie is pretty well done and the werewolf cane remains one of my favorite cinematic props. The design is just so bizarre, yet straight forward. One can only wonder who - or what would create an item like that. That is left in the dark though, rightfully so, it is more creepy to let it be left to the imagination. On the acting side we have a pretty good performance from most of the cast, much in contrast to Frankenstein even the minor roles does a good job in this one. There's not really any stand out performances in this one, so consider this a "good job" mark to the entire cast. The look of the movie is very cool, as I said most of the movie takes place on foggy night and I really like what they did in regards to The Wolf Man himself, not looking all that much like an actual wolf but still something beastly and unnatural - something that will give into desire and instincts. 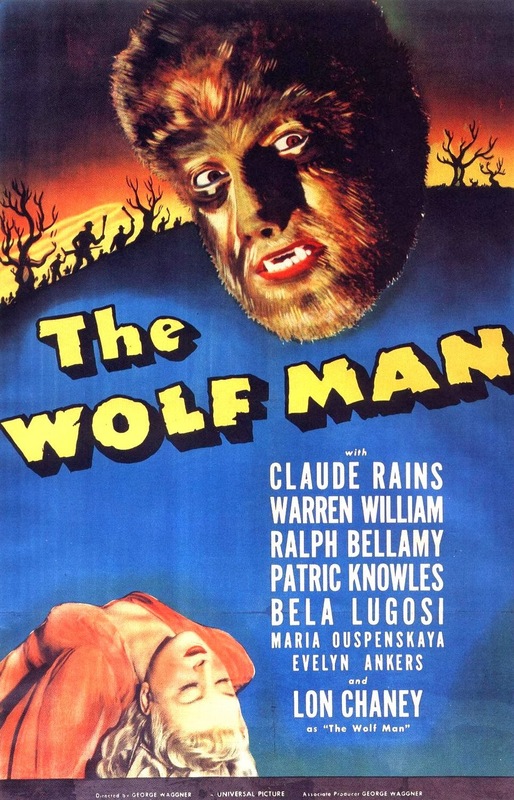 The Wolf Man is a very straightforward film, much like the nature of our main character. It gives us an interesting spin on the werewolf legend, one that oddly enough hasn't been imitated all too often. Honestly, compared to modern werewolf designs who look like giant wolves walking on two feet, or in some cases just plain big wolves, this design is much more streamlines and dare I say it, humane. This monster actually looks like a man taken over by the beast within more than just a person turned into a big anthropomorphic wolf creature like in movies like Underworld, Van Hellsing or Dog Soldiers, but I digress. If you want the movie that kickstarted werewolves into public conscience, this is most definitely it. And it is a timeless tale of being overcome by the duality of man.